THRICE THE BRINDED CAT HATH MEW’D. By Alan Bradley. Read by Jayne Entwistle. Random House Audio. 9 hours; 7 CDs. Hardback print edition form Delacorte Press. 331 pages. $26. It’s happy days for the many fans of Flavia DeLuce, the 12-year-old sleuth and chemist. After a brief “banishment” to a girls’ school in Canada, Flavia has (to her delight) been “re-banished” back to Buckshaw, the crumbling family mansion near the British village of Bishop’s Lacey. So she’s free to resume her unusual 1950s childhood, free from school or governess. She has time to indulge the curiosity that often involves her in the solving of unusual murders. Only the days, even though it’s almost Christmas, are not nearly as happy as they should be or as Flavia envisioned them when she was feeling alone and abandoned in faraway Toronto. No one but Dogger, her father’s factotum and longtime friend, shows up to meet her at the docks. Her older sisters, Feely and Daffy, are as unwelcoming as ever, and Undine, the orphaned younger cousin the family has taken in, only annoys her. Even Esmeralda, her pet chicken, is missing. Worst of all, her father is in hospital with pneumonia. Flavia, as fans of Alan Bradley’s delightful series know, has always been a lonely child. Her mother disappeared in mysterious circumstances when Flavia was very young, and her father, crushed by that loss, by his experiences in World War II and by the massive burdens of trying to hold Buckshaw together, largely neglects his daughters. But Flavia has always loved him greatly. And, because of surprising recent developments, Flavia is trying to figure out how best to deal with the reality that, through her mother’s will, she is the owner of Buckshaw. Not allowed to visit her father, Flavia has very little to do, a situation that usually leads her into trouble. 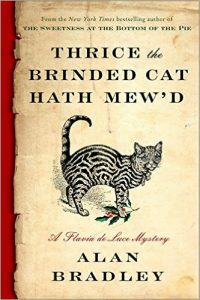 Sure enough, when the vicar’s wife asks her to deliver a message to a woodcarver in a nearby hamlet, Flavia discovers the man dead in unusual circumstances, with a cat being the only other creature in the house. Elated that she has an investigation to distract her from her boredom and her worries, Flavia sets to work. As usual, she uncovers a tangled web of secrets, not to mention dangers, before triumphantly solving the mystery – or at least some of they mystery, as Flavia’s new 12-year-old maturity leads her to reflect upon the ambiguities of crime and of life in general. As the story unfolds, Flavia has more challenges to face than even her sometimes perilous adventures in chemistry and detective work have ever presented. In recent books in the series, Bradley has introduced tantalizing bits of information about what Harriet was doing when she disappeared and why Flavia, the youngest of her three daughters, inherited both Harriet’s estate and her role in a secret society called the Nide. Both Flavia and Bradley’s readers have a lot to learn about all this background and what it means for Flavia’s future. Presumably, things will become a bit clearer as Bradley favors us with future novels. For now, enjoy Flavia’s latest adventures riding Gladys on icy country roads and taking the train up to London. I recommend my dual approach: I read the print book as soon as I can get my hands on it. Then I listen with great pleasure to the audio version, as the gifted Jayne Entwistle brings Flavia to life with an endearing accent and a perfect blend of precocity and vulnerability. This entry was posted in Audio Books, British mysteries, Detective fiction, Mysteries, Young Adult and tagged Alan Bradley, Flavia de Luce. Bookmark the permalink. As usual, your comments are right on the money about this book. It’s a joy to see Flavia return to Buckshaw and Dogger. These books are deeply satisfying, both in the tale and in the character of Flavia – a bright light confronting all comers with her intellect and faith in herself. Ya-roo!